A sleek, protective case with an integrated stand that allows for portrait and landscape viewing for the iPad, iPhones, & iPod Touch. Hi KickStarter! Thanks for visiting our page! With your help, we’d love to release our newest products for the iPad 2 and iPod Touch 4G. 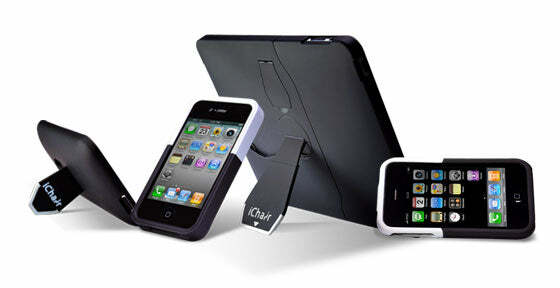 iChair is a sleek, protective case with an integrated stand to view your iDevice in portrait and landscape mode. We wanted to make a multi-functional case that didn’t sacrifice protection or a slim, sleek design for iDevices. More importantly, the stand had to be built-in and not an extra piece you had to carry with you. Other cases with stands we saw on the market were often fairly bulky, difficult to use, or lacked stability. Our design eliminated these issues. Each case is manufactured with dual layers of protection. The exterior is a polycarbonate plastic with a rubberized coating giving it a soft, velvety feel. The interior of the iPhone/iPod Touch cases are made from an injection-molded TPU (thermoplastic polyurethane) which is a soft rubber, great for shock absorption and protection. The iPad interior is lined with a soft, microfiber to avoid scratches and dings. Not only did we want to create a case that was protective, but it was important for us to use quality materials as well. 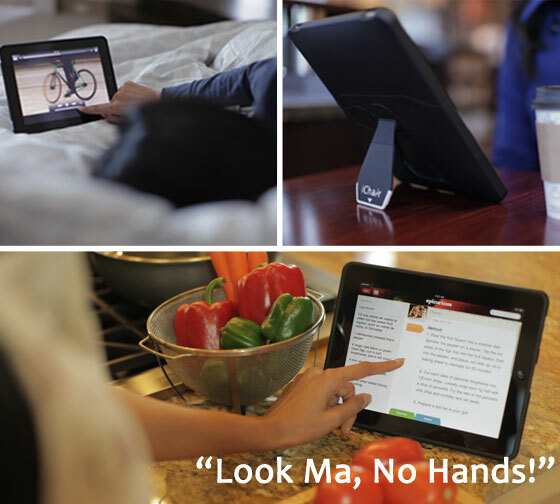 We wanted to make the stand super easy to use, while still allowing you to view in portrait and landscape mode. We designed the iPhone/iPod Touch stand with three flat edges to allow you to rotate the device in any direction. 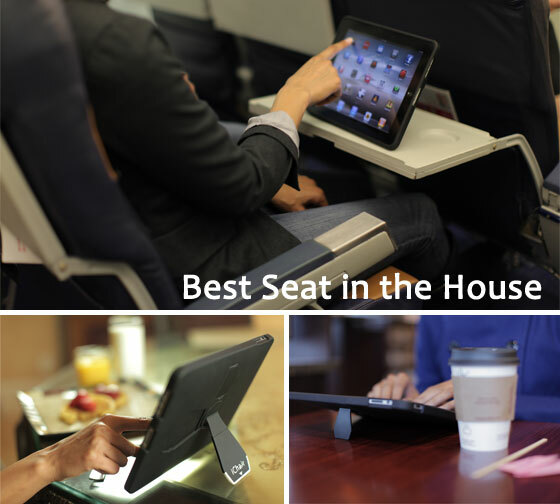 Once opened, the stand locks into place with a quiet click, allowing ultimate stability. The iPad stand has a similar design, but also rotates 360 degrees. We also created a small keyboard tab that pulls out for convenient typing at the perfect angle. 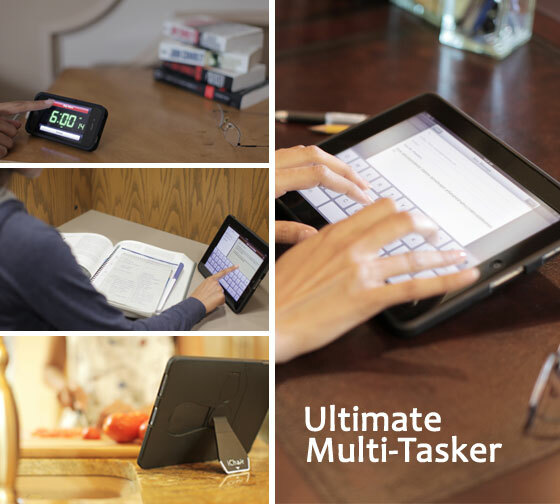 When the stand is not in use, it simply folds back in, flushed with the case for ultimate portability. All of our cases are slider style to allow easy access to all 3rd party accessories. Each package includes a standard black case with an extra top slider piece in either blue or white for easy customization. Every case also comes equipped with a screen protector, dust cloth and squeegee board. After a couple of months of solid research, I decided to travel to China to manufacture and develop my dream product. I quit my job and poured all my resources into the iChair line of products. A few months later, after going back and forth with our factory, I was finally able to launch our first line of products just in time for CES. Since then, we’ve received amazing feedback and very positive reviews. You can check out what a few folks have to say about iChair : iLounge, BeatWeek, i4u, TUAW, and iPhoneLife. Thanks to all of you who have reviewed our products. We are truly grateful for such positive feedback! Simply put, manufacturing is very expensive. We’ve poured all of our savings and resources into developing and producing the first line of iChair products. Our factory in China has required a minimum of $15,000 to start the production of the iPad 2 and iPod Touch 4G case. In order to have these products available on time, we really need your help and support. We are very excited to be a part of the great culture Kickstarter has become and we only hope to make it grow. We are also giving exclusive deals on all Kickstarter pledges so please check out our pledges to the right! We set up our tier structure to accommodate US and International shipping orders, so please check the correct tier level depending on your location. Thanks for taking the time out and reading our project. We hope you see the need for iChair in everyday life as much as we do. Please support us and check back with us often for updates!